Once you have clicked on the 'Install UTU Swiss for Free Now!' button, Internet Explorer display a Security Warning, click on 'Run' to continue with the install. Click on Run. It will then run a security scan and display the message below. Click on Run to continue the install. The installer will then install the required standard Microsoft components. The first is SQL Server Compact 4.0. Click on Accept to continue the install. 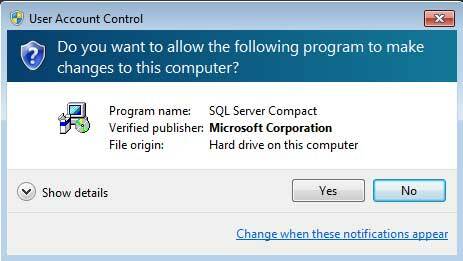 Once SQL Server Compact has downloaded, Click on Yes to install SQL Server. 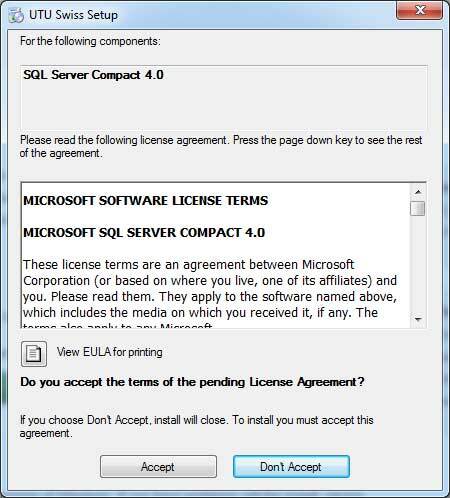 Once SQL Server Compact has installed, UTU Swiss will start to install, but a security warning will be displayed. Click in Install to download and install UTU Swiss. Once it has downloaded and installed UTU Swiss will automatically start.